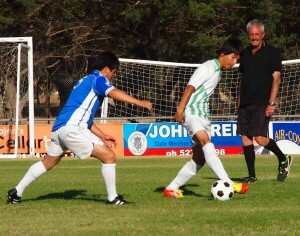 Geelong and Bell Park came out on top against Geelong Rangers and Lara respectively at North Geelong’s Elcho Park to complete round one of matches in the Geelong Community Shield on Sunday night. Geelong lost Aleksander Stanisic with what looked like a serious leg injury inside the first minute. After settling down, Geelong dominated the rest of the first half against Rangers and ran to a two-nil lead thanks to a successful penalty kick and bit of opportunism by nuggety striker Jasko Ikanovic. Rangers fought back after the break and created numerous openings but was unable to convert any of them into goals. Then teenager Adam Milenkovski of Geelong was given space to work his way from the left wing into the middle and he finished with a rocket shot into the top corner to complete the three-nil win. Rangers’ assistant coach Adrian Begg thought that Rangers’ youngsters did their best in the absence of a number of senior players, while Ante Didulica of Geelong praised his defence for their efforts. 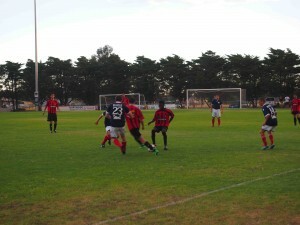 Daniel Innes (23) of Geelong Rangers closes down two Geelong attackers. Bell Park took the lead against Lara in the 28th minute. Matt Demo showed experience and coolness in front of goal with a shot into the bottom left corner of the goal following an attack down the right win. In the second half Lara came more into the game and in the 50th minute a corner kick from the left found its way to Ben Houston who had positioned himself correctly near the far edge of the penalty area. Showing great technique the youngster struck a sweet volley which gave the Park keeper Matthew Damjanovic no chance at all. Parity only lasted four minutes and Bell Park won a free kick on the left. Matt Demo drove the ball along the ground through a ruck of bodies and just inside the far post. James Kociski might have got the slightest of touches but referee Mitko Nikolovski credited the goal to Demo. Lara should have been on terms in the last minute of play when a handball in the area gave Simon Purtill the chance to equalise from the penalty spot. But Damjanovic blocked the kick and Purtill struck the bar with the rebound and the ball was hooked clear by the Park defence as the referee blew the final whistle. A flying header by Bell Park’s Ifeanyi Ihfeanacho (34) goes just wide of the Lara goal. 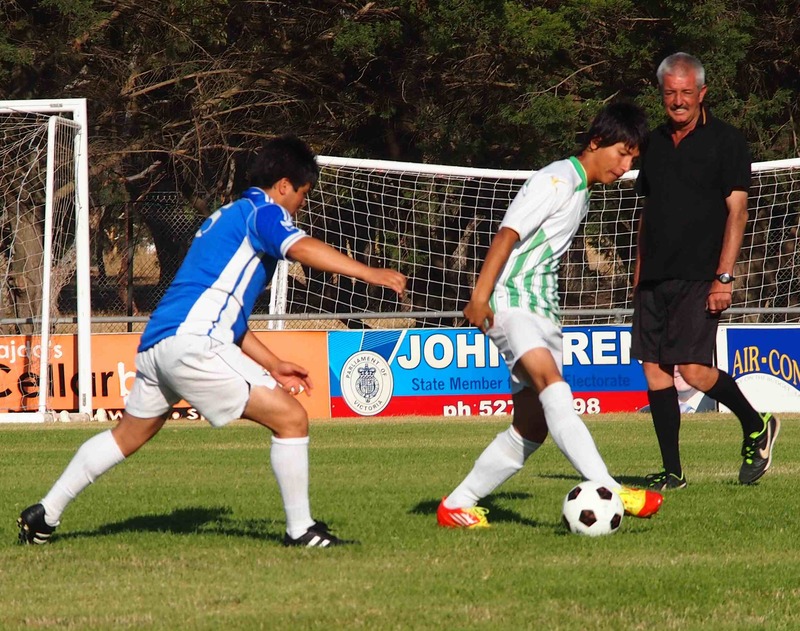 North Geelong and Corio drew two-all in the opening match in the 2014 Geelong Community Shield which this year celebrates the diversity of the groups involved in the local game. The curtain raiser involved a team of youngsters from Afghanistan and another made up of players from seven different countries in Asia and Africa. If anyone doubts that multiculturalism is alive and well in Australia today, this match was a powerful demonstration that football can bring people together and help them settle into our modern society. 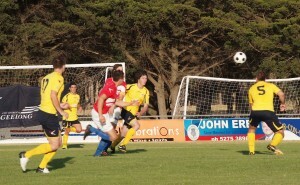 Action from the curtain raiser on opening night. 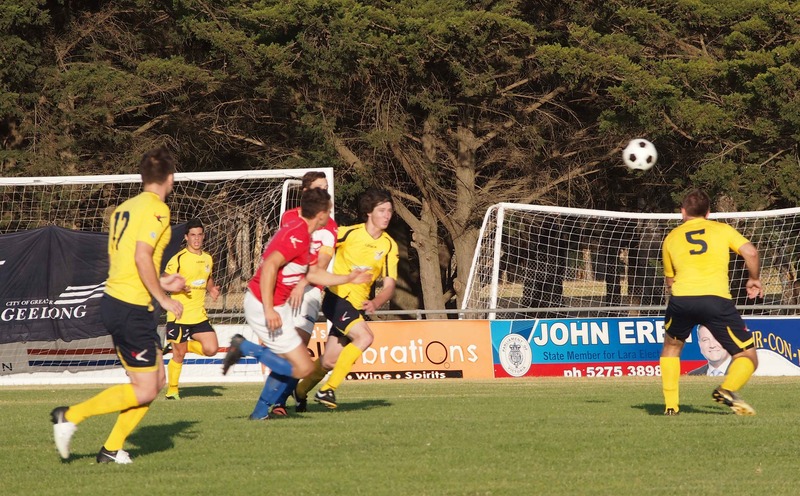 Last year’s champion, North Geelong, took the lead after only five minutes when Corio keeper Alex Kitanovski handled a pass back and conceded an indirect free kick. Michael Anderson rolled the ball into the path of Ross Wallis who blasted the ball through the defensive wall and into the net. 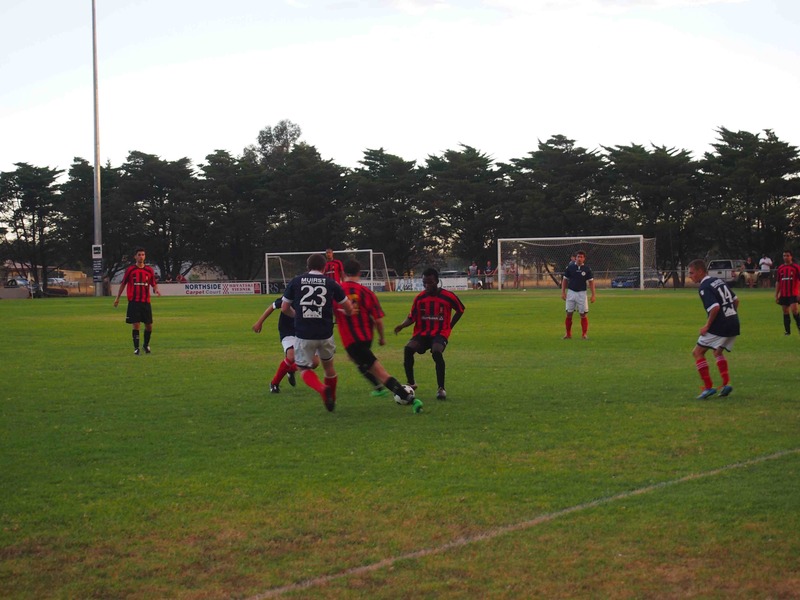 It took Corio until the 27th minute to find an equaliser when a corner kick bobbled around the North goal area before Justin Hanns, who had come up from defence, poked it home. 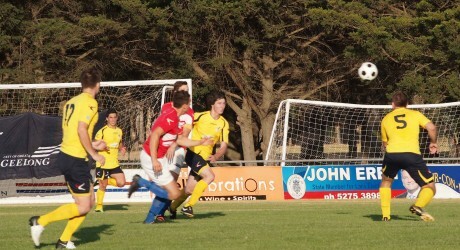 Justin Hanns (centre) and Steve Luczo (right) combine to clear their lines for Corio against North Geelong. The second half was only six minutes old when Michael Boyar took advantage of some slack defending by Corio to restore North’s lead. But that only lasted a couple of minute until Liam Nelson latched on to a throw-in from the right and beat Franjo Saric from close range. North did have the ball in the net after a corner kick but the goal was chalked off for obstruction though there did not seem to be much in the incident. North did not protest and the match petered out in a draw. On Friday 7 February, Corio takes on Geelong at 7 pm, followed by North Geelong versus Bell Park at 8.20 pm. North’s floodlights enable these games to be played later in the evening to the benefit of all concerned.